URANIS offers a series of FURUNO's GPS position indicators. Range of units and repeaters cover the entire marine market from the smallest boats to the ocean going vessels. Compact in size, waterproof, yet big on power, features and performance, Furuno’s GP32 is perfect for a wide range of smaller fishing boats and pleasure craft. This advanced unit, based on the popular GP31, provides an accurate and reliable position fixing, thanks to a super sensitive, 12-channel GPS receiver combined with the integrated WAAS technology. The new GP37 DGPS/WAAS Navigator is compact in size, yet big on power, features and performance. This waterproof unit is perfect for a wide range of boats. It is equipped with a WAAS and a DGPS receiver as standard supply. It utilizes both WAAS and differential radio beacon correction methods to give you the most accurate fixing position available. 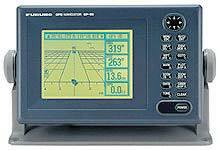 The Furuno GP80 and GP80D are high-performance GPS navigators designed for virtually every type of vessel. Built around Furuno's high-performance eight-channel, parallel receiver, the GP80 and GP80D offer a wide range of verstile graphic and data display modes. The GP80 is a DGPS-ready receiver that can be linked with an external Differential beacon receiver. The GP80D has a built-in DGPS receiver.